Shapeshift into your Dream is a shamanic journey to reclaim your Shapeshifting abilities and use this power consciously to embody your purpose and become your dream now. I beg to disagree. You, like most of us, are a consummate shapeshifter. You are not the same in every situation. You do not behave in the same way with everyone. Who are you when you are with your parents? With your spouse? Your boss? Your children? You go to the doctor and your blood pressure, usually normal, goes up to border or hypertensive. You are feeling great and suddenly you remember that you have to do something you dread, and you begin to feel a headache, anxiety spirals in your stomach and your feet become so heavy you can’t move… in the direction you don’t want to go. You are feeling the weight of the world in a job you hate, and they suddenly fire you. The truth? You feel relieved and the weight is instantly lifted. You feel free and light, whereas 10 minutes ago you were burdened and constricted. Then you begin to fear about your income, and you panic. Now you feel ungrounded, anxious and dizzy. Your energies are scattered. Your heart is heavy again. All of these conditions change your appearance, perspective, the way you relate to others, to yourself and to the world. Even if you were, you are so used to seeing yourself as you think you are, that you won’t see it… unless someone else points it to you, and then Wham! You are shocked to realize that your appearance has changed drastically to match your vibration. This is how common shapeshifting is in your life. I am spaced! This was AMAZING! Thank you so much! A whole different meaning to SHAPESHIFTING! I thought that I knew what shamanism was about…? And you begin to feel, look and act in a way that IS your dream and EMBODIES your purpose… right now! Discover what’s possible in your life with a few shifts of posture and perception. 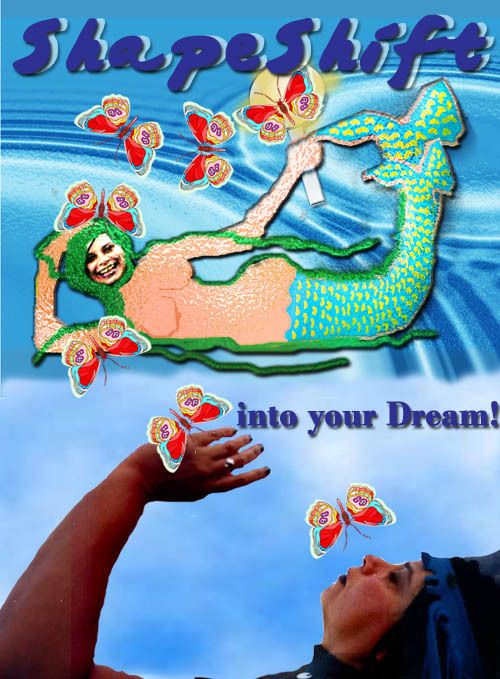 How about ShapeShifting into your dream? Detect how you can raise your vibrations and land your dream in your life, right now. Discover why your actions are ineffective and how to harmonize the two types of actions you need to create powerful, effective, focused actions that bridge the distance between you and your dreams. Learn the function of the Logical Mind and the Creative Mind in your manifestation and understand why making plans and goals before you align with your soul is putting the cart in front of the horse. Allow your chakras to indicate with uncanny precision what is the distance between you and your dream and what you need to do to bridge it. Learn to access the wisdom of your BodySoul to find your Personal Compass that always points true North to your dream and discover the right action to take at any time. Ground your dream in your body, here and now, to embody your purpose and become your dream… now! Come and share this joyful, exciting, mind-stretching and creative journey with me, and you’ll be on your way to jump-starting your dream. Not to mention it is fun, relaxing and magical! I give each journey 2.5 hours and accept only a small group of women for each journey so that I can answer YOUR questions and give you personal attention in each journey. I recommend to choose a date for the beginning of the series, so you go through the proces step by step. Choose from the Journey 1 dates below to buy your 3-Journey tickets. This event includes downloadable Playsheets for each journey. If you are in the DreamCrossover MasterSoul Group, you will have free access to these journeys whenever they take place. You will receive a free pass directly to your email, with three notices so that you don’t miss them. Only one discount applies for each registration event. For 3-Journey Tickets, choose the beginning cycle for each series, so that you are covered for the 3 consecutive journeys. They are: Journey 1: April 23/ July 23 / October 22. Per Journey Tickets, we recommend start with journey 1. Try it. Like it? Get the next one. Affiliate sign-up for this event. Get 20% of ticket price when you promote this event to your friends or Tribe.